A blog posted on Kramm Reporting’s website on Jan. 17 provides an overview of the U.S. Department of Labor’s OSHA guidelines regarding depositions. Lawyer David J. Berardinelli and paralegal Gavin Jensen talk about a recent international arbitration they held via videoconference in a Nov. 27 post on the Constance Lee & Company blog. Berardinelli and Jensen shared a few advantages to videoconferencing, including being able to see the witness in person without having to spend money on travel. The differences between written and spoken language were explored in a blog post by Cleveland Reporting Partners, with examples from Seinfeld and My Cousin Vinny. In a press release issued Nov. 20, Marty Herder, president of Herder and Associates, Phoenix, Ariz., offered advice to first-time deponents and the counsel that calls them. This advice included letting the witness know to only answer what they are asked. 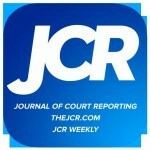 The JCR Weekly contacted Warren to hear more about My Guardian Angel. What inspired you to get involved in this charity? Before starting My Guardian Angel, I attended a class on forming 501c(3)s. I left that seminar with a new appreciation for the time that would be involved to make a 501c(3) successful. However, it was going to require way more time than I had to give since I had also just started a new firm. I read somewhere online about an organization in California that donates duffel bags to foster children for them to use when they are transitioning from home to home. While the idea was truly a niche charity, it was meeting a need that many did not know existed. I was intrigued. At the same time, the events of Ferguson, Mo., were going on. My heart was heavy for kids who grow up in an environment where police officers are feared instead of being looked at as a protector. When I was growing up, we were taught to run towards the police (safety), not away from them. I surmised that in order for that to change, kids needed a reason to perceive law enforcement differently. After melding these ideas together, My Guardian Angel was formed. My Guardian Angel gives backpacks to law enforcement agencies to give to children in unfortunate situations, thereby creating a bridge, planting a positive seed. Those circumstances may range from being removed from their home in a domestic situation or a situation where the caregiver or parent is arrested for drugs. These children, many times, do not have suitcases of their own, and their personal belongings have to be put in a trash bag. These officers are sometimes called “first responders.” They are on the front lines. These officers wait with the child until someone from the Department of Human Resources shows up. In other instances, an officer may need to gather a child’s belongings from a car accident scene, and they have nothing to put the child’s things in other than a trash bag. Our backpacks (along with a toothbrush and toothpaste) are given to law enforcement agencies to keep in the trunks of their cars for just such occasions. While a simple backpack with an angel’s wings and the words “My Guardian Angel” certainly can’t remediate the child’s problems, it gives the officer an opportunity to create a positive memory. They have something tangible to give the child, and it gives the agent an opportunity to share with the child that they are there to help. The child may never know who Alabama Court Reporting, Inc., is nor the officer that they encountered who gave them the backpack, but our prayer is that it will help that child, if only for that one moment in time, see that officer as their guardian angel. If we achieve that, then we have been successful. Have you received any comments back about your project? Yes! We have had people call and want to help us buy backpacks! In giving to different agencies across the state of Alabama, we have had people call from those communities wanting to help. Giving inspires someone else to give, and it is the coolest thing to see. 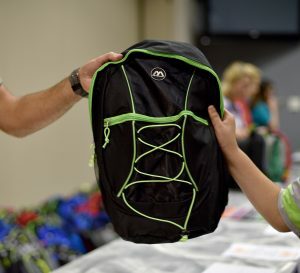 In other instances, we have delivered backpacks to agencies only to have them ask: “How much is this going to cost us?” And other times we have had them ask: “Why are you doing this?” This gives us an awesome opportunity to explain our desire to change the perception of their community of law enforcement. What would you tell other people about giving back? Figure out what inspires you and give to that. Start small. Just because you can’t matter to many doesn’t mean you can’t matter to one. Let your life start being one big random act of kindness. Giving back doesn’t always mean giving monetarily. Do what you can, where you are, and build on that. We can change the world we live in; it just has to start with us! A blog posted on Sept. 7 on JD Supra by Kramm Court Reporting offers the eight admonitions most common on the checklist of attorneys. 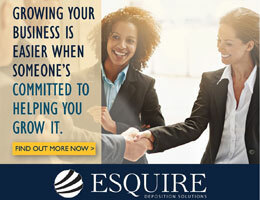 WealthManagement.com posted an article on May 11 that includes hiring a court reporter as one of seven critical steps suggested to build a better prenuptial agreement. Tips for how to present in wired and non-wired courtrooms were featured in a blog post by David Andre of PlanetDepos. The post was picked up by JC Supra on May 4.